On Tuesday my buddy, Danielle, and I took good 'ole Milt Dog to the local dog park. 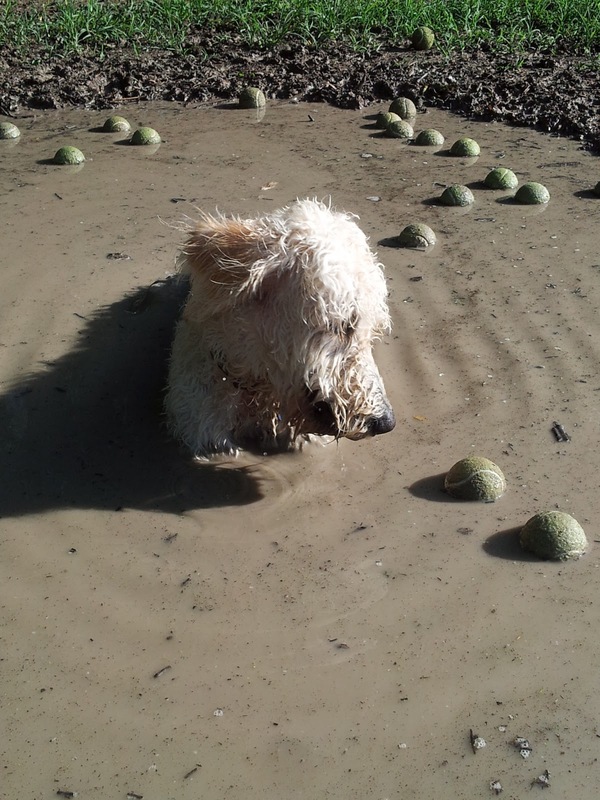 As of late, we have been forgoing the "dry" land area to splash around in the lake and paddle after tennis balls. This time, following our swim, we thought we would take a foray back onto firm soil in an attempt to dry off by scampering after more tennis balls. 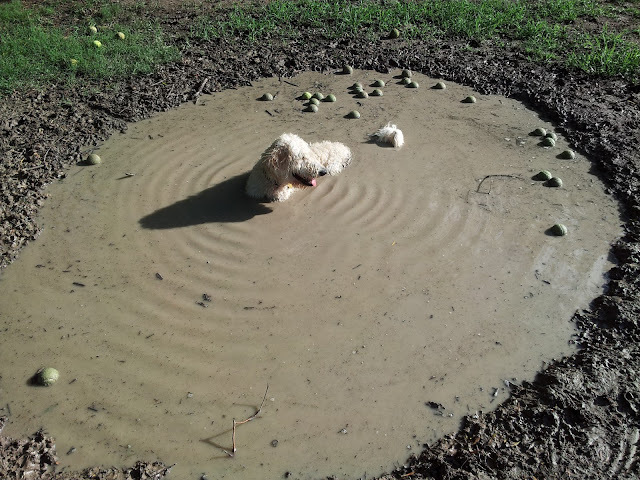 Silly me threw a ball in the direction of this massive puddle, and wouldn't you know that it bounced right in? Of course, Milton bounced right in after it. Mud is just irresistible to him. Happy as a pig in... #%*$! Still fixated on that ball and surrounded by so many more! Danielle and I carefully persuaded the boy to leave his puddle, so we could douse him with clean water from a hose. For some reason, Milt Dog was still awfully stinky, so a bath was also desperately needed upon return home. Milton, like always, had an absolute blast getting good and dirty, and I think these photos will certainly make a nice addition to our Milton photo wall! Holy #%*$ that LOOKS stinky! But you know he had one heck of a time! Sometimes the best of life is unsophisticated. Doesn't he make the puddle look cool in the Dallas heat? I have been dying to go swimming...!